Digitalisation features in many headlines and fills up conferences and blogs. Whilst the challenges and opportunities posed by these new technologies are worthy of research, the very innovative nature of these developments makes them difficult to assess. The DigiProfiler allows companies to take stock of their digital strengths and weaknesses and formulate a thorough and effective digital strategy. It is a complex task to examine the company-wide impact and value of new technologies. What’s more, new technologies can easily entice with promises in directions that might not be core to the success of the company. And it can also be difficult to impose an analytical rigour and structure upon something that is so nebulously defined as “digitalisation”. Illutas have created a digital profiler to support companies that are struggling with these issues. This “DigiProfiler” maps the business impact of technology changes across a company-wide evaluation framework to create a measurable and practical view of the company’s digital performance. The DigiProfiler is both a methodology and a tool that allows companies to take stock of their digital strengths and weaknesses and, from that, formulate a thorough and effective digital strategy. What is so difficult about digitalisation? Developments in digital technology are nothing new, but the speed and scope of change that is taking place, combined with a cultural acceptance as well as economic feasibility, make digitalisation a real and forceful driver for transformation. Digitalisation mostly involves enabling technologies that applicable to many different business areas and activities. The Internet of Things can measure anything from heat and pressure to a customer order for more detergent. Robotic process automation can assist in procurement or HR processes. Blockchain can be used for contracts, money and master data management. Therefore, working backwards, i.e. looking at technologies to determine their application in business, is not feasible, as it covers an overwhelming plethora of choices. It also poses a high risk of being led into the wrong technology direction. As technology changes should support business objectives, it is best to work from the other direction. This also creates challenges: suitable areas for digitalisation are widespread, ranging from supplier collaboration to intelligent work-resource allocation to customer service robots. It is not easy to get a strategic as well as an in-depth view of the situation. Therefore, a firm prioritisation and performance measurement basis is required to ensure the strategic relevance and focus of digitalisation. Lastly, building a sound digital strategy requires a good analytical basis of high quality, homogenous and structured information, that is filtered for bias but reflects a diverse and balanced perspective. The widely differing nature and impact of digital technologies make that hard to achieve. The digital profiler deals with these analysis framework and information quality issues. A business journey is defined as the sum of experiences from a group of stakeholders with the company. The DigiProfiler spreadsheet has a questionnaire and several reporting sections with analysis views and summaries. It guides the process of capture and analysis and requires no specific technical skills. 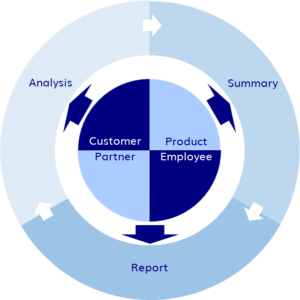 The DigiProfiler analysis framework is based on the “business journey” concept. A “business journey” is the sum-total of experiences, usually described as a lifecycle, of a group of company stakeholders. Journeys are particularly suited to digitalisation analysis, as they cross functional boundaries. For instance, a customer does not notice or care for the move from “marketing” to “sales” when they stop browsing and start purchasing on a website. Journeys also are easy to visualise, which makes them an ideal analysis vehicle and this natural story-telling approach can be readily conveyed and used in many environments. The DigiProfiler has 4 journeys that encompass most business processes and activities and give an end-to-end view of the business value chain. The journeys come complete with stage goals, descriptions and best practices to ensure information consistency and quality. To provide a firm prioritisation and performance measurement basis, strategic fit and digital performance are measured for each of the stages on a guided, normalised scale. These two measures create an insightful view into strategic digital performance, relative strengths and weaknesses, consistency, potential synergy and opportunities of digitalisation. There are 2 more dimensions to complete the DigiProfiler picture. “Perception bias” is dealt with by looking at both the internal (from the company) and external (from the stakeholder) journey perspectives, which can provide very differing and illuminating results. Additionally, information from up to 3 different groups can be captured to provide contrasting results. All this information is entered into a single guided questionnaire and then automatically collated, summarised, analysed and presented in several ways, leading to the compilation of a digital profile report. This includes added-value analysis, such as a digital maturity map and a SWOT analysis. What does it all bring? 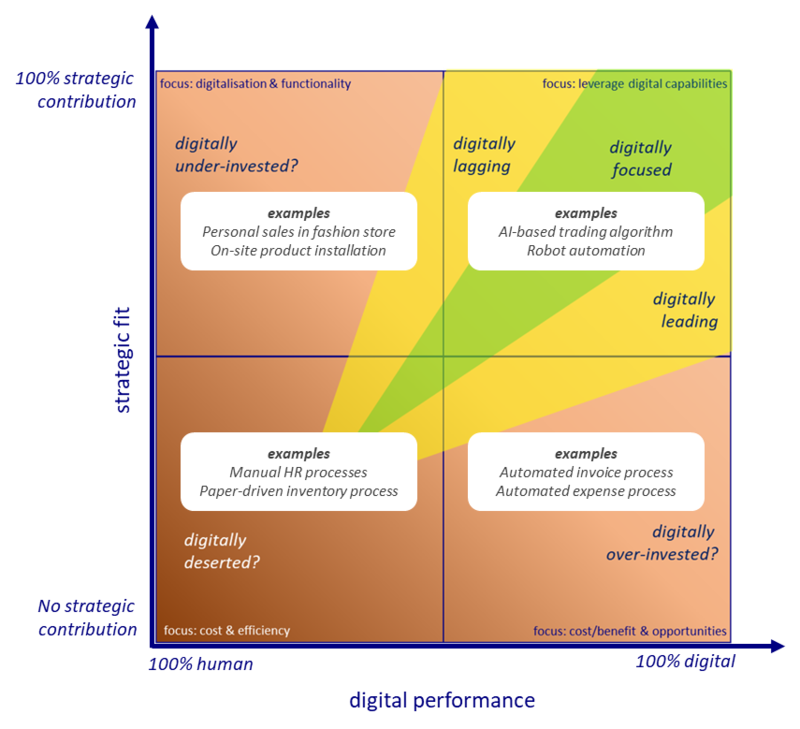 The digital performance map creates a company-wide platform and a vocabulary for strategic digitalisation discussions. At the end of this fairly straightforward exercise, the company has a clear view of the relative importance and digital performance of the company’s activities, which is a sound foundation for a digital strategy. 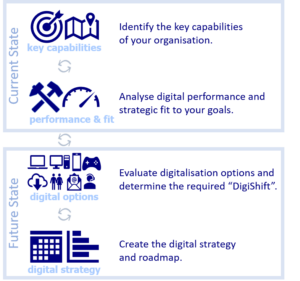 This company-wide digital performance map also creates a platform and a vocabulary for strategic discussions on the topic to identify possible areas of opportunity, synergy and overlap. It can also lead to wider discussions on the relative strategic importance or not of the various activities and expose strategic weaknesses and strengths that were hitherto not expected. First, visit our download section to download the (free) DigiProfiler and supporting documentation. Next, complete the DigiProfiler. There are several approaches, such as workshops, questionnaires etc., to capture the DigiProfiling data. After collation, this information will need to be validated and adjusted to reflect relative positioning and scoring. Lastly, the information needs to be interpreted, commented and summarised, which can be done using the supplied report template. This current state assessment is followed by the digital strategy definition. This definition can be executed in various ways, such as using the DigiProfiler in “time-slice” modus (for current and future state capture), using the “DigiShift” approach (details in our Services section) or by feeding the DigiProfiler results into your own strategic approach. If you’d like to know more, please get in touch on info@illutas.com. If required, Illutas can also provide consulting services to support DigiProfiling and other IT strategy themes. More information on those services can be found on this website.